Chief Clancy Wiggum might very well be the dimmest and most incompetent civic leader in Springfield, but as long as he has a gun and badge, most citizens exercise their right to remain silent. After many a late night stakeout and after thousands of early morning donuts, this top cop offers up his procedural wisdom on what it takes to wear the shield, how to keep on the right side of the law, and the real cost of quick and speedy justice. 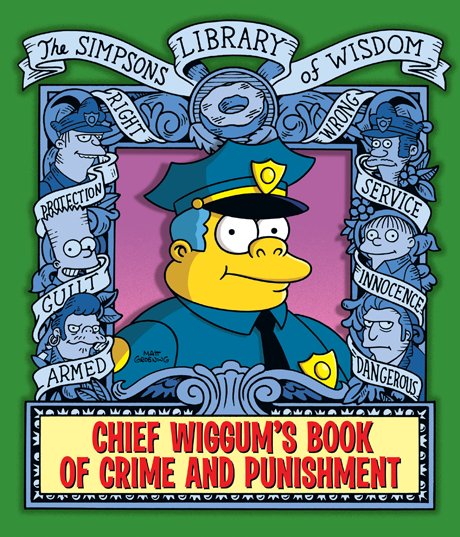 On Wiggum’s watch you’ll check out the seized property auction catalog, learn the secret language of police codes, find out how to avoid a speeding ticket, line up with Springfield’s usual suspects, and get the skinny on Springfield’s most wanted criminal...El Barto. Join the big boy in blue for the ultimate book on law and order.